You must have the Papyrus 1.2.0.1 patch installed prior to installing this mod!! Unzip to your C:\Papyrus\NASCAR Racing 2003 Season\series\ directory. 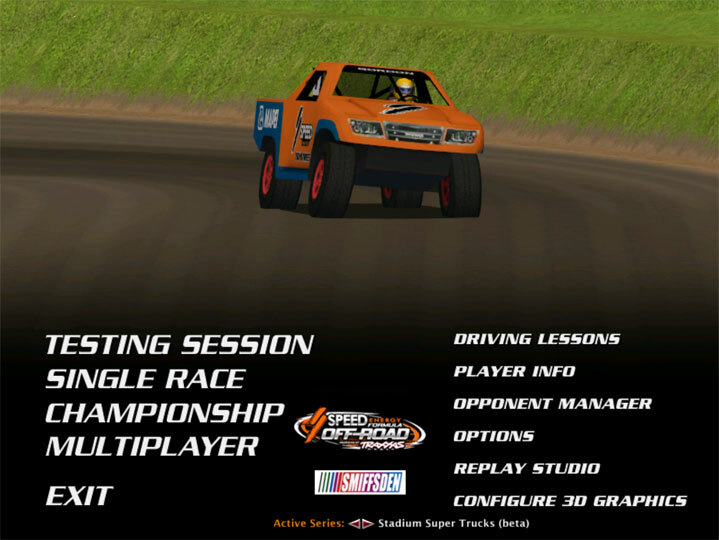 Mod contains one "truck" model based on the Stadium Super Truck Off Road Racing Series. An example setup to simulate the Trucks behaviour is included. A paintable template is in the template directory. One painted truck is included. There is no damage modelling (guess most people running off road series do so with damage off). There are no dials/lights/data in the cockpit view, just hands and steering wheel. The Pace Car has no driver model LOL. The SST Driver model is static (for now). When flipping, the Truck roof will sink into the ground, nothing we can do about it I'm afraid, lots and lots of virtual beer, pot and mince pies on offer to the first person to discover where the collision box data is in the game. These files will be hosted ONLY at Smiffsden.com, Sim Racing Design, Ground Pounder Designs, The Mod Squad and V8Thumder.co.uk! Please be respectful and do not re-post the mod files to other file sharing sites without the permission of Smiffsden. Please DO share this mod, but just link to the respective sites that host it and do not rip or redestribute it as your own work. All material is protected by the Online Copyright Infringement Liability Limitation Act of 1998 (USA) and Copyright, Designs and Patents Act 1988 (UK). Any misuse of Smiffsden content without express written consent will result in a DMCA Takedown notice being filed with the ISP of the offending website/group. Use at your own risk as there is no warranty provided.